In this episode, Izzy says nuts to all that danger business and enters a cheat code to make Tentomon digivolve. We also finally learn some things about this joint. For an episode that still falls within the “basic introduction to character and corresponding Champion Digimon” template (only two more to go! ), this one had some serious meat to it. It's the first time we get some actual information about the Digital World, the first time we get an angsty flashback and the first utterance of the word “prodigious.” As an added bonus, the first time Izzy uses it, it's actually a correct descriptor instead of a catchphrase. We've had episodes for Matt and Sora... technically Tai if we're sticking with the formula. We've gotten a snippet of info on Matt's story, but all we saw of Sora was how she interacts with Biyomon. Nothing about why. Izzy's episode cuts right to the chase, explaining away his thirst for knowledge with a brief but sharp flashback: he wants to know more about everything because his parents are denying him information about himself. Pretty heavy stuff for episode five, and the look on Izzy's face when Tentomon draws that memory out is something else. Last time, I said that Sora and Biyomon are a little farther along in understanding this whole partner thing than anyone else. No better evidence than the way Tentomon talks to Izzy here. There's a sense of both boredom and admonishment when Izzy insists on processing every bit of data there. Izzy only reacts when Tentomon is seemingly suffering due to it. Granted it turns out to be the cheat code that lets Tentomon digivolve, which may be a little counter-productive to the message: the same focus on cracking the code that distanced Tentomon proved to be what pushed him to the next level. That's not quite how it should work, but Izzy does have a habit of breaking the game on a regular basis. In the process, he stumbles upon the big secret: the Digital World is a manifestation of data. Good thing that's cleared up! Nice work! Shame he doesn't mention it beyond a frantic cry as he rejoins his teammates. We'll have to get more in depth on this in the future, lest we forget the big action sequence where Andromon tosses around Greymon and Garurumon. It's commented that Andromon is stronger than both of them put together (he's an Ultimate, but we haven't gotten into such terminology yet), but it's mostly that Andromon is adept at throwing one into the other at every turn. Izzy and Kabuterimon finish him off. There's some other fun stuff in this episode as well. I like it when the team is split up, even voluntarily like this. It lets each character breathe a little more. Team Matt/Mimi/TK was under-utilized, spending most of their time watching the assembly line assemble and disassemble widgets, but Team Tai/Sora/Joe was fun. The facial expressions, physical humor and Tai's crane action provided some good stuff. Not bad for a boring introduction episode. Remember what I said about Gomamon being one of the more useful Rookies? I take it back. Agumon and Biyomon didn't really faze Andromon, but at least they had something to throw at him. Can't any of those fishes give themselves up for the cause? The “stay still” gag last time was inverted this time to “why are we standing here frozen” as Tai comments negatively on their actions while he's doing them. It almost breaks the fourth wall to the point where it feels like an Abridged dub at times... or Samurai Pizza Cats. Silly, silly dub. I don't mind when the team forgives the monster of the week and moves on, but openly befriending the de-possessed mon that just tried to kill you is weird. It made sense with Meramon as the Yokomon consider him a mountain guardian, but being all buddy-buddy with the Andromon that just randomly woke up and went immediately into kill mode? Even stranger is that this “lasting friendship” carries all the way to season two... after he goes into kill mode again! The dub really screwed up in this one with Kabuterimon. He sounds utterly bored. Also, I find Andromon's slowness weird. Seriously, he doesn't come across as too threatening when he moves like a glacier with rheumatism. This wimpification gets really annoying. Do not have Agumon and Gabumon evolve if you do not want them having the glory. 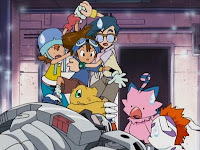 Or have Greymon and Garurumon stun Andromon while Kabuterimon takes the gear out. What struck me was how did Taichi get back on the ramp after he jumped to ge tthe controls? 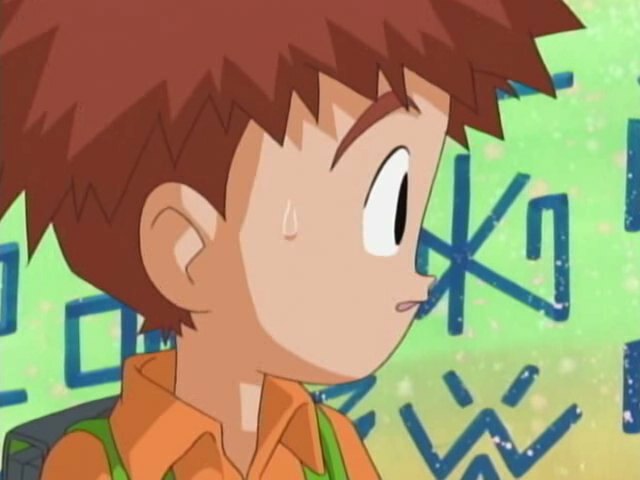 I'm watching the sub now (watched a Croatian dub long ago) and there isn't really 'instant friendship' going on with Andromon, he apologises sincerily ('I've done an unspeakable thing' in the subs) to them, with Matt saying something like 'Don't worry about it. It was a minor malfunction.'. Ends with Andromon saying that while he'd like to answer all of their questions, he doesn't know the answers. 'Least I can do is give advice on how to leave this place.' showing them the way to the sewers. Fun thing is that he says 'I wish you the best of luck in returning to your world.' and no one reacts to the wording (I think he uses 'modo no sekai' from what I can hear). Most interesting episode to date, especially on Izzy's end. 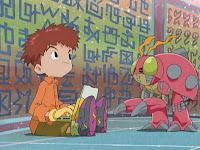 His and Tentomon's interactions are golden, it's great how he discovered the secret of this world being truly digital and part of a large computer-esque system, and I love the way they touched upon what motivates him to seek knowledge so intently and at times desperately - for as smart and gifted as he's always been, there was this one thing he did NOT know until he overheard his parents talking about it. Something they'd been keeping from him. We don't even find out what it is, but just from the way the moment is framed you already get the sense that this is heavy stuff here. Andromon, despite being the first Ultimate level we've seen, was unfortunately less menacing than Meramon was. Maybe if he didn't move so damn slowly and speak in such a goofy sounding voice. Speaking of goofy, what was up with Matt, TK, and Mimi here? Their part in the episode was just so odd it was hilarious. And yes, Kabuterimon's voice acting here was just...huh?? ?